I think things are being over analyzed. Who is to say that forerunner ever cared for anything in this universe to begin with? What makes us think that GS343 is working towards forerunner goals. Who is to say if anything surrounding covenant and human decent has anything to do with forerunner ether way? First I propose that our universe/Realm of existence was in the time of the forerunner nothing more than a quarantined universe used for study and experimentation on the Flood. Halo was designed to contain flood and keep it manageable within this realm. In a lab environment you donﾒt want your specimens to be eating the table or running down the hall, even if you donﾒt care about the dean, it just makes since to keep it under the lenses in the Petri dish! This is essentially what Halo is! Architecture: Halo's design layout appears to be two fold. Scientific and strategic planning. It is NOT military in design, I site that every structure and access point to halo is an airlock (two doors for every access point) blast doors for inter access locations (tunnels that connect between what appear to be maintenance halls) every entrance is angular meaning you make a turn before and after every door you go through (this indicates internal desire failsafe in case of blast scenarios) These indicate that Halo was designed for strategic defense. Next: in the level GS343 the underground structure is mainly built for scientific research and quarantine lockdown. There are two levels here, The lower level is closed and constrained. There is little to NO intended access to the upper level. This indicates whatever is on the low level needs to stay there. this is maintained by the energy bridge leading to tee exits and the blast doors at every entrance. Also note the airlocks upper deck has a glass floor! No doubt for observation of what is running around downstairs. Also not the double blast doors and the containment barrier and observation deck outside the Flood containment aria and the blast doors covering what appears to be containment cells. And the air/fluid fonts on the floors. (these are similar to what is used in containment in CDC SAC rooms) these rooms were built to house gaseous pathogens and possible infected specimens. The lack of a decent lab table indicates that large specimens were studied here, possibly the macro lab? Only issue here is the fact the blast doors are so darn week! Call it a design flaw, call it old (100,000 years or more) equipment, whatever it is, the flood just beat the doors open. Anyway moving on. The control room. Ok this is just interesting. The building was designed to be DIFFICULT TO ATTACK, not impenetrable. This is for strategic defense, if the flood does become unmanageable on halo well they cant get control OF halo! SIDE NOTE: notice all the airlocks? Well this tells me one thing. Halo can be vented into space! This indicates flood may not be able to survive in a vacuumed! It makes since, most microorganisms tend to "pop" in a vacuumed. I can and probably will repost a complete analysis of the structure of halo but right now I donﾒt have time. suffice it to say Hal is not a military installation "halo is not a cudgel, you barbarian" it is a scientific installation. Its design is to this end. I note the lack of ANY forerunner weapons! Save halo itself. Halo was used to study flood or some other similar micro/macro organism and halo's varied environments only support this. It probably is mobile, and possibly inter dimensional travel capable. In my educated opinion it was brought here to study what was deemed dangerous research and our galaxy/universe is the test chamber, if forerunner was so advanced, why would they study flood in their own universe and risk infection? They wouldnﾒt! when they were done OR when things got out of hand, or when their funding got pulled, they left and left halo (and her sister rings) here. "let those pesky covenant fools deal with it." sounds right. they might have fired it just to "tidy up" a little. Before leavening. Like I said who says they cared? New light has been shed on the Covenant-Forerunner relationship that may indicate a greater likelihood of the above-mentioned view. Both the human race and the Covenant client races may have been only gleams in the respective eyes of various single-celled creatures scattered across this galaxy when the Forerunner(s) passed on. Wado SG has started an interesting forum conversation on the possible origins of the word "Halo", specifically the Greek root which can mean, of all things, "threshing floor". Some great ideas. Others have joined in and so should you; help separate the wheat from the chaff! You know those Forerunner symbols on the walls on the 343 Guilty Spark level? We've been looking at them for almost two and a half years now, yet they continue to intrigue us. Proving that there's always room for more speculation, skraeling has posted an excellent analysis of that level over on the HBO forum, with particular emphasis on the symbols, the door lights, and the overall layout of the rooms. There are already a few really good responses in the thread, so if you've got a mind to, get over there and get reading! Did 343 GS pop into anyone elses mind when "Guardian of the Lumious Key" was mentioned in FS? I know that it was said that they were supposed to be on the Covie Flagship, but when I read those words, the scene in The Library where 343 "dematerializes" the index... The index is obviously the key to activating Halo (the main key, anyhow), and it is very luminous w/ its glowing-glow-like prettiness. This would, in a sense, make 343 the "guardian." 343 also says he is the "monitor" of the Halo, which would mean he's pretty much in charge over everything there, further showing my point. The Covenant, correct me if I'm wrong, were looking for the Guadian of the Luminous Key when the Flagship was commandeered by the Chief and friends (its been a while since I've read the book, so I may be wrong). What if they were looking for 343. It seemed odd to me that 343 still had his be! 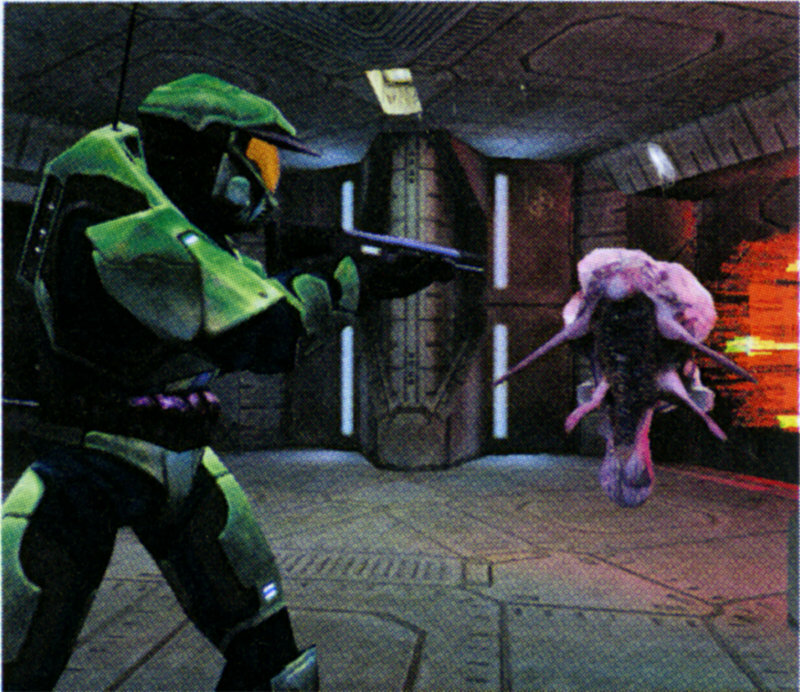 acon-like blue light pulsating once Halo was destroyed at the end of the game. Even in space, it might be hard to miss a blue light that was moving, even harder so to miss one that was moving AND pulsing, considering how advanced Covie search must be. Maybe 343 can't turn this feature off, but considering how it looks like a beacon, it seems more probable that he WANTS to be found. Also, about a year ago, I wrote a piece of speculation (rather crazy speculation at that) to HBO that never got posted (no biggy). I said something to the effect of how Dr. Halsey was the big conspirator behind everything that happens in Halo and before (during the Spartan-II's lives). I later dismissed this as crap, so I wasn't confused why it never got posted. I think I said something like, during the augmentation procedure of the Spartans, Dr. Halsey imprinted a little something more into the minds of her patients, such as possible "forced-memories" of the Forerunner. When I read TF and FS, I was shocked at the Chief's "knowingness" of how to activate certain things (like the Light Bridge), and his "deja-vu" that he experienced. I was also shocked when Halsey just took off w/ Kelly on a mission of her own, after altering Kelly's DNA. I'm quite amazed at how close thi! s comes to my old speculation... There is way more to Halsey than any of us can imagine, I suppose. And about "S-IIIs:" If they are Spartan-IIIs, the fact that when the ONI staff meeting is held and they are refered to as "special weapons programs" makes them seem a little less human than Spartan-IIs... perhapes they're machines, or mainly machines, like in the more common concept of a cyborg (Spartan-IIs may be cyborgs, but they're not so much machines as you see in a lot of movies). Also, a lot seem to forget about the significance of the "failed" Spartans, the ones who didn't completely make it through the augmentations but still survived. They still prove to be geniuses in various aspects, since one of them provided Keyes with the insight that the Covenant were traveling towards Reach in mass, which, as the Spartan said, can make them look like one object, thus giving the UNSC at least a little time to gather a defense force (even though it still failed, in a sense). What happens by the last book of the Night's Dawn Trilogy, is that humans are sort of coexisting with aliens, but the humans are possibly on the verge of extinction due to an unfortunate turn of events back in book 1. One of these alien species is far in advance of human technology, but have a non-interference rule, as they believe that each species needs to resolve their own philosophical problems. Yet they believe that humans COULD possibly be a great boon to the universe, provided they manage to survive their current state of affairs. So they start to make plans for the initiation of a "separate origin". The point of this, is that they will get the necessary sperm and ova and DNA samples of the human species, and if the human race exterminates itself, then they will have the necessary resources to start a new human colony planet. Gah! Durandal again. Curse his fiendish deviltry! Well, I saw Lori's post, and I think his second idea IS possible (Forerunners are small). Heck, Maybe they are some flying brains (ok this sounds stupid) and wears Robotic suits? Maybe the highest evolution is to ditch the body and leave the vital part-- the Brain (Maybe the heart is with the brain). That could explain the big and small doorways, maybe the small ones are emergency entrance for the forerunner to enter or exit the area when something went wrong. Yeah, I know that's an Engineer. But where do you suppose the Engineers came from, hmm? Hmm? I was thinking...Cortana says that the forerunner called Halo a Fortress world. Well, maybe the forerunner existed in a time of war (kinda like the 17-1800's) and built Halo like a castle. Think about it, with the extreme landscapes (Desert, Ice Covered Wasteland, and Cliffs hundreds of feet high) it would be extremely difficult to capture it. Not to mention the underground passages, where you could hold out for years. This could explain the flood and Halo's "Final" Weapon. The flood could be used in controlled amounts (kinda like backburning when people are trying to put out a forest fire) against invaders (which would explain why their survival as a race was dependant on studying and containing the flood"...they could have had to keep studying the flood to find ways to improve them as enemy forces found ways to kill them...and if the invaders were about to capture the ring, they could activate Halo...as if to say "congratulations, you've defeated us...now say goodbye to the galaxy"
Which brings me to another theory...In the X03 vid, Marcus Lehto said "We really want it to feel like that there was a history, there was a, uh, there's damage, that existed from some battle that happened 900,000 years ago"
The Flood though, as a controlled substance? Man, the Forerunner must have been very advanced, especially in crowd control and bio-hazardous waste management. Ok so everyone knows that there is something interesting about Captain Keyes last name- its kind of obvious. I like how mnemesis responded to a particular article in the "The Flood" section. Mnemesis said, "Very interesting possibilty. It would explain the need to keep the Flood alive, yet be able to "neutralize" them by destroying their food source. If so, then it would seem that there would need to be some sort of a counterpart to the "Reclaimer", who would release the Flood rather than set off the Halo. Hmm...." This made me concoct an interesting idea. "Isn't it possible that the flood figured that they should combine Keyes (with his immense skill as a captain) with the commander of the covenant cruiser? That way, they'd get the best of both worlds... a blob with Keyes' smarts, and the covenant commander's knowledge of the ship and covenant technology..."
The theory I have proposed would fix just one problem in Fletchers theory. If the flood have a covenant commander, why would they need Captain Keyes? I think the covenant commanders know how to fly their own ships. maybe keyes was need for another reason, possibly to serve as the "key" that i proposed earlier. Just something to think about. Maybe Captain Keyes is the key. Or was. Was the key. It seems to me no one is ever going to be give the poor Forerunners a break about keeping the flood around. I would like to point out that even we humans are guilty about taking something that was once incredibly dangerous and killed hundreds of thousands, and then instead of eradicating it we merely contained and studied it. Small pox. And while not on the same plane of deadliness that the flood exists on, if small pox was released there would of been a huge epademic as it would of taken months to make enough vaccines for everyone. So give the poor forerunners a break, it's something intelligent species do, study, even at their own risk. See, it's not that they kept the Flood around. We've had more than a few submissions that pointed out that many human countries stockpile nasty, virulent things. No, the big question with regards to the Forerunner is why destroy the entire galaxy in case the Flood get out? If the Forerunner don't occupy this galaxy anymore, then why not just let the Flood have the whole thing as a playground? If they do occupy this galaxy (or did, at some point in the past), what is so flipping special about the Flood that they'd destroy all, but still keep 'em around? So, no! No break for them!! This theory is based on the idea that The Forerunner could be infected by The Flood. "The installation was well conceived. It is surely the only way to end The Flood threat." "The installation was specifically built to study and contain the Flood. Their survival as a race was dependent upon it." It appears that Halo was designed to destroy The Flood while at the same time it was designed to study and contain them. Quite a paradox we have here. ?I am grateful to see that some of them survived to reproduce." It seems that 343 GS can?t keep his thoughts straight. The Flood are too dangerous to release so they must be exterminated yet he is glad to see that some have survived. Perplexing indeed. I believe that The Flood were at war with The Forerunners. How this started and the origins of The Flood are irrelevant at this point. The fact of the matter is that The Forerunner were fighting The Flood. It is apparent that destroying all life in the galaxy was the only way The Forerunner could destroy The Flood. This has led me to the conclusion that Halo was conceived with two purposes: 1) Destroy all Flood. 2) Imprison X amount of Flood (possibly for interrogation?). If this is the case than Halo was designed with the ability to protect The Flood imprisoned within, but not exclusive to, the facility in the swamp on 343GS. Perhaps The Forerunners did this because they wanted to keep Flood specimens alive in order to find out what the cause of the original Flood "outbreak". This could be misinterpreted as wanting to keep The Flood from becoming extinct. So, if my theory holds, it would seem that Halo is both a Galactic Prison of sorts while at the same time being the Executioner. If 343 Guilty Spark has actually gone the Monitor's equivalent of insane (and there's not much evidence to the contrary), then it'd be easy to imagine him "misinterpreting" things to ensure the Flood's survival at all costs. Intriguing! T Steeves was playing through The Maw, listening to 343 Guilty Spark and scrutinizing his dialogue, and has come up with a few keen observations. I was playing the level Maw recently and listened for anything intereting that he may say. That said, I picked up a couple key points to ponder. "Oh how I will enjoy every moment of its categorization! And to think that you would destroy this installation. As well as this record. I am shocked. Almost too shocked for words." He refers to the ship as an installation... Meanwhile, 343 GS calls Halo installation 04. Now, what do Halo and the PoA have in comon? Is it possible that they are both vehicals or transports of some kind? Or is there another reason he calls the PoA an installation? "You would destroy this installation, as well as this amazing record?" This means, he is not refering to the records when he says the installation.